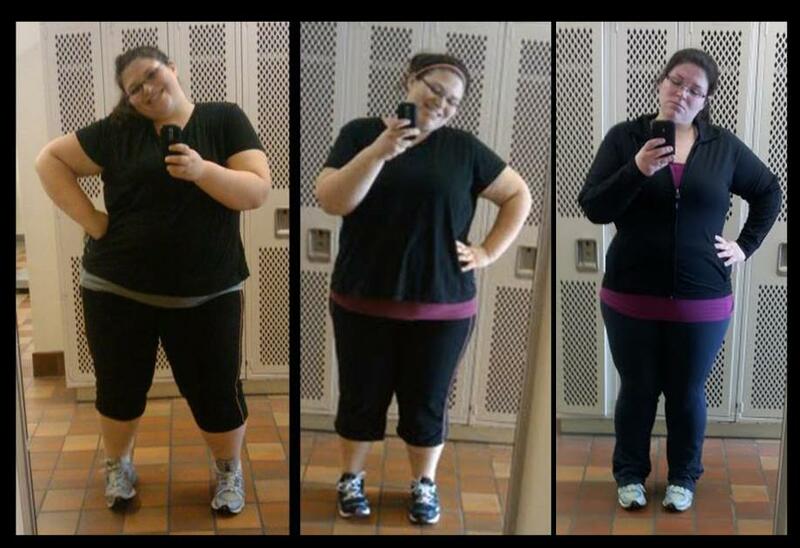 Runs for Cookies: Weight Loss Success Story: How Carly Lost 100 Pounds and Started Running! Thanks for sharing this, Katie! It made my morning! Now off to run! GOOD FOR HER!!! I like how she's going right for the half-marathon! We know overweight people can run because Bob and the trainers make them do it on BL. Gosh, the 1st episode this season they had them do a 40 yard dash and I think ALL of them had their ankles taped up! People just have to realize they're not going to run a 5 minute mile starting out (it's possible to get there someday). It really is true that "slow and steady wins the race" and "sitting is better than reclining, standing is better than sitting, walking is better than standing..."
That is amazing!!! You go girl!!!!! Woah. Here is my sign. I am 279 lbs (down from 300! Woot!) and I really, really want to run-- but I am afraid. I guess it is time to face the fear! Carly-- PLEASE start a blog!!! I would love to follow you and be a support team! You are SO inspirational! Now it is even MORE a sign meant for me... I have that dress. 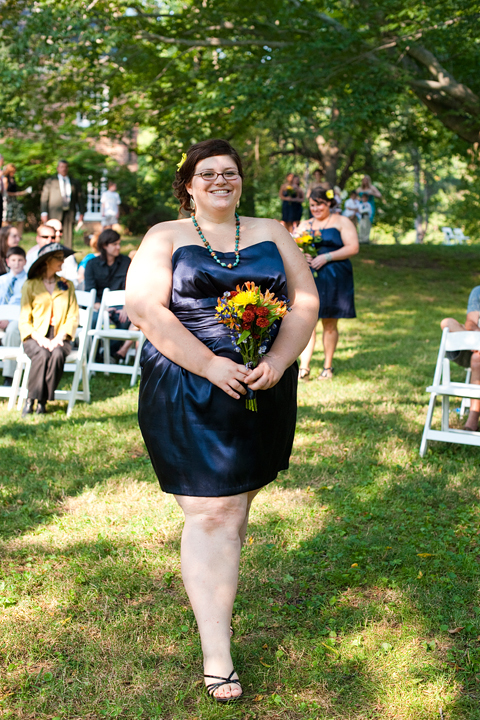 Wore it to a wedding almost two years ago and bawled my eyes out when the pictures came back. That is awesome! 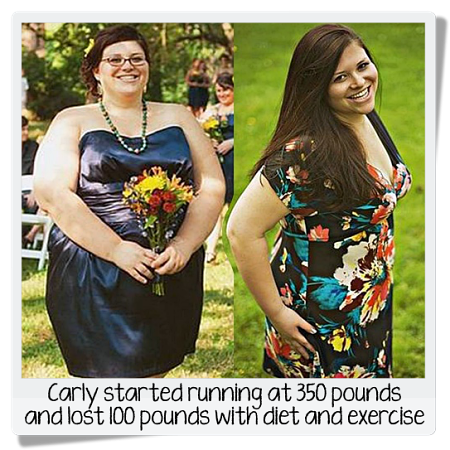 Carly's journey with running sounds so much like mine! I too started the C25K weighing in at 220lbs in aug. I have chronic knee and hit problems which some days hurt but no more than the pain of being heavy. 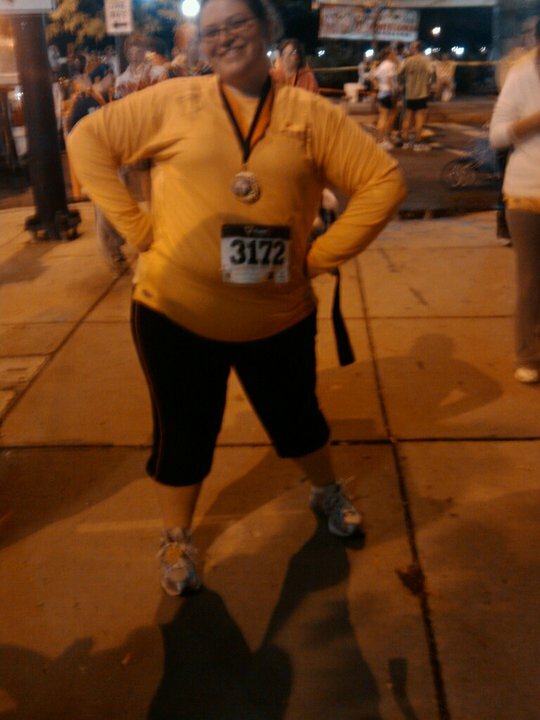 I crossed the finish line in oct 2011 to my first 5k race at 200lbs. Her comment about week 4 of the program is EXACTLY how i felt when doing it. It actually took me 2 weeks to complete week 4 and when i ran my first 5K i was too on week 7. Sounds like i could've written her story just with my name. Now i am able to run 4miles in 50 minutes. It was only last week that i hit my "runners high" I thought it was a mythical thing that runners told non runners to get them to start running. And i finally feel like i belong to that elite group of runners which i always felt i longed to be while watching from the side lines...the fat girl who on the inside felt like a runner but could never be one. Well, now I AM A RUNNER! I have lost 60lbs in the last 7 months and i feel amazing. Still have more to go but it will come off eventually. Carly, you're awesome! I'm down about 10 pounds from 265 and I'm working through the first bit of C25K - I also did Week 1 twice because I'm working through shin splint issues. Slow and steady wins the race. You're absolutely an inspiration. I'm looking at your photos and I really feel like, if you did it, maybe I can too... At this point my abilities are limited more by my shin pain than by my cardio abilities. I also went and got fitted for really good shoes and looked at by a physical therapist. Thanks so much for sharing your story so far and I too hope you'll start a blog because I'd love to follow you! What an inspiration! In my running program, 2 weeks from today (week 5 of the program) we are scheduled to do a 22 minute run with no walking intervals! I've been freaking out about it. I'm with the others, Carly needs to start a blog!!!! I am sitting here crying right now . This is so inspirational .I am on this journey too and some days it feels like I am trying to run through quicksand but when I see stories like this where people ,women,worked hard and accomplished their goals it means so much.It means every time I am running and feeling like I am just to large to do this I can think back to Carly,to Katie and know that I am not alone and that I CAN do it . Thank you so much for this post I really needed it today . You should start a blog !! Very fun post...good job to Carly! This is brilliant, thank you for sharing her story with us! I started C25k at 296 pounds and I was as proud of myself that first day of running 60 second intervals as I was finishing my half marathon a hundred pounds later. We can do absolutely anything we set our hearts on! Carly, please start a blog!!! I'm single mom with a three-year-old boy. Right now I'm finishing up grad school, but I'll be a career woman by the end of the summer. I weighed 300 pounds when I started, and I'm down around 200 pounds now. This past fall I ran two marathons and a 30-miler. I would love to read a blog written by you because I feel like we have so much in common, and I find you to be very inspiring. Keep up the hard work, woman! SO AWESOME! I am just done week one of the C25K at 300lbs and I am SO excited to ready this. I am going to go and sign up for a 5k run too. THanks for sharing her story!! I have a running book where the author says if you are overweight, then lose it before running; what's the point of running then?? So thankful for reading Carly's successes! 2 more suggestions from my experience as an overweight runner: take fish oil tablets and joint meds with chondroitin. My joints were the first things that started aching and the fish oil lubricated them. The joint meds my doc suggested, but I'm not seeing that much of a difference. Overweight runners unite! Wow I can really relate to this girl! She needs to start a blog! Great post! I LOL when Carly said she yelled out her weight upon crossing the finish line. Thanks so much for sharing your story! I've been a little freaked out because I'm starting the C25k tomorrow, in fact, at 270 pounds! This post couldn't have come at a better time! Carly you are a ROCK star!!! She does need to start a blog! 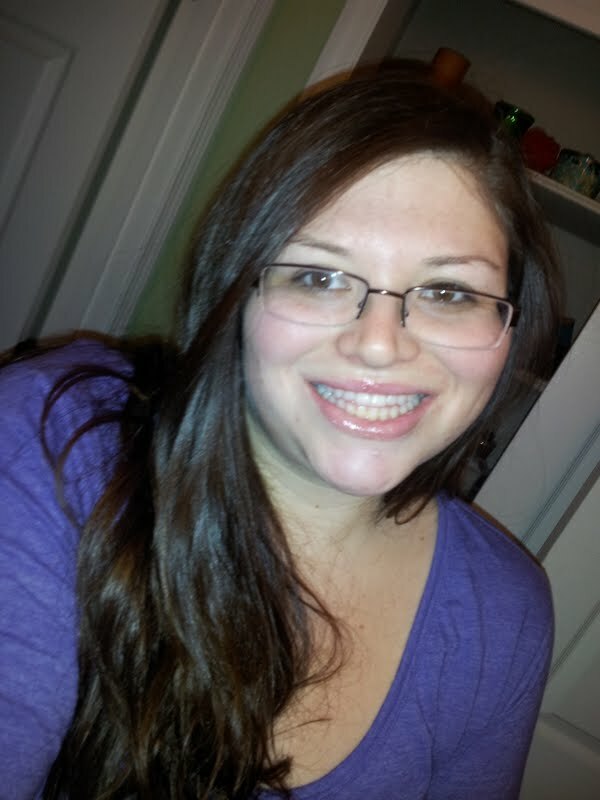 I am so thrilled you had her do a guest post! I love reading your posts every single time because you were not just chubby...you were big. I am BIG! I am not crazy enough to type my weight here. But reading this and your regular posts I feel even more motivated. I started back to the gym last week and I hate being the biggest person there. Well there is only one way to change that so here I go. More excercise and better food choices. PS I tried oatmeal with peanut butter, honey and bananas the other day. Incredible! Never would have put peanut butter in there if not for reading about it here! I love you both! Ha! I started running just like Carly. After seeing pictures of myself and not knowing who that girl was. It was horrifying. At over 300lbs, Im sure but never got on a scale. I started the C25K program too. I also signed up for a 5k at the end of the program and ran my first ever 5k in 48 minutes flat! I got on the scale that day. About half way through the C25K I started WW and weighed in at 257! I knew I had lost weight running but didnt think it was much! 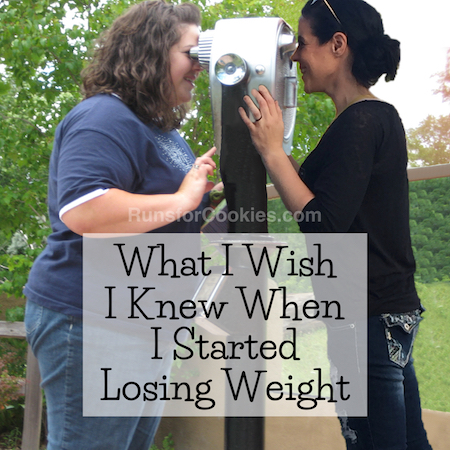 But Im sure I had lost at least 25-30lbs! Right after that I suffered a pulled and torn muscle (read me being dumb) and had to sit out running for several weeks. Then I suddenly became a mom to a 16 month old son and running went right out the window! Just on WW I got down to 229 and was feeling great. And then I thought I could do it on my own...I quit WW and struck out on my own. This was all about 4 years ago. I am embarrassed yet oddly feel empowered to share that I am currently at 247lbs. 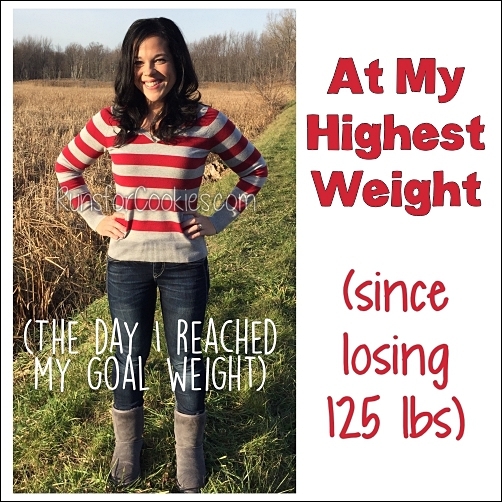 Embarrassed because I could be at goal and maintaining if I had stuck to it, but empowered because I have listed my weight publiclly now 3 times! I know what works for my body and I also KNOW that this is my year. I have been walking as much as possible since Dec. and Im working on food choices. I know that I could go to WW and follow the plan, but I also know that at some point I need to be accountable to myself too. And I miss running desperately. I love it. I think so much better when I run. I feel alive and vibrant when I run. I need to run! This was exactly the motivation I needed to see to push on and get it back. Thank you to both of you, for sharing, providing a place for us to share and be inspired. But mostly for your honesty. Fantastic and inspirational! Thanks for sharing!! Go Carly, go!! AWESOME! I've finally managed running 3 miles (with a .25 warm up walking) on a treadmill. it takes me about 40 mins to do the whole 3.25 miles. I want to do a 5K in the spring. i think I will be signing up this week! Thanks for the inspiration! Thank you for this post! It made me smile. I've been working on losing weight since July. So far I'm down 45 pounds. I'm currently sitting at about 212. I want to try the C5K, but I keep telling myself I need to lose more before I can run. 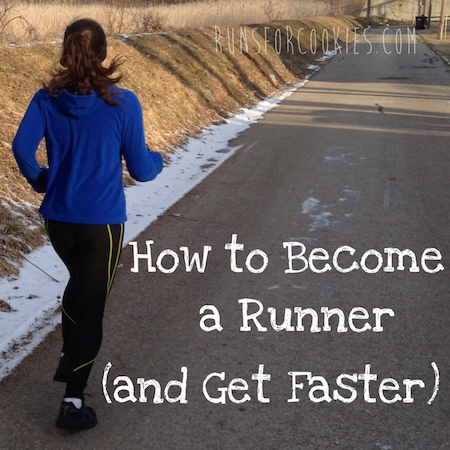 Now, because of your story, I know I too can become a runner! Thank you for honestly sharing your journey!!! Wow, truly inspirational! 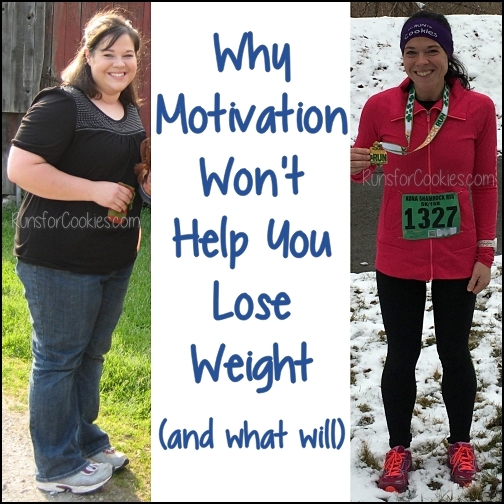 I have always thought of myself as being too "fat" to start running. I weigh 213 down from 248 in June 2010, but up from 204 in 12/2010. I may have to find someplace to run without an audience though. Thanks to both Katie and Carly for this post. Absolutely amazing! Makes me want to get started right now! Truly an inspiration. Thank you for sharing this. Im the same Anonymous who wrote about the bad shin splints on the other post, I really need to get a blog name thingy! Im making an appointment to the orthopedic on Monday. Im not going to lie, im jealous of Carly. Lol. I know its not good to be jealous, I just wish I was able to run with no pain, like her. I attempted to train again today after doing the proper stretches and buying Dr. Scholls inserts and was in pain STILL.I actually ended up bawling this time and my poor boyfriend was there to console me. I realize now that its my weight, my weak shins cant handle my 235 lbs., 5'11 frame slamming on the concrete. I hope the orthopedic doctor will give me the clear and ill be able to train again! I want to thank you so much for posting this. I am in this place where I want to run and this was very inspirational. I am doing a 10k in May and I am looking forward to it. Thank you for sharing this story. 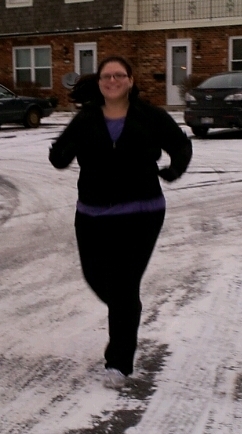 I was so terrified to start running, but if Carley can do it, I can too! I ran my first ever road race at right around 260lbs, it was a half marathon. I've run 7 half marathons total weighing between 230-270. It's easier at lower weight, but no less gratifying. Anyone can run, listen to your body and/or your doctor for cues to when you can't. It doesn't matter if you run or walk, or run and walk, or walk and run. By choosing to get out there you are doing far more than anyone who chooses to judge your method of getting to the finish line. The feeling when you cross the finish line is priceless... at any weight. Came here from Jen's blog. Way to go Carly, you are fabulous! 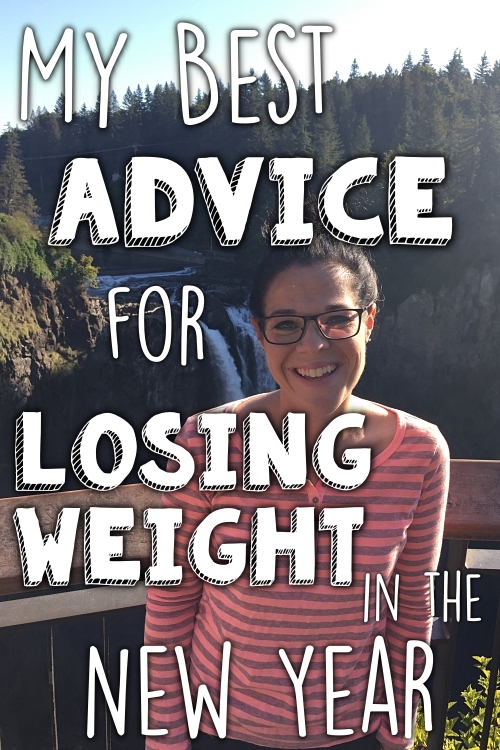 Thanks for this inspirational guest post! I am currently on a weight loss journey myself (I need to lose close to 100 pounds. 20 of which are gone already! )and also a beginning runner. I am working through a C25K program and have yet to sign up for a race. Afer reading this, I think I'm going to take the plunge and register. I'm currently looking into 5k races in my area. I've been thinking about it for a long time. I've done tons of 5ks but never running! I really want to start running and this is the motivation I needed!!! Thank you to both of you! Katie thanks so much for posting Carly's story. She's fantastic and needs a blog!! 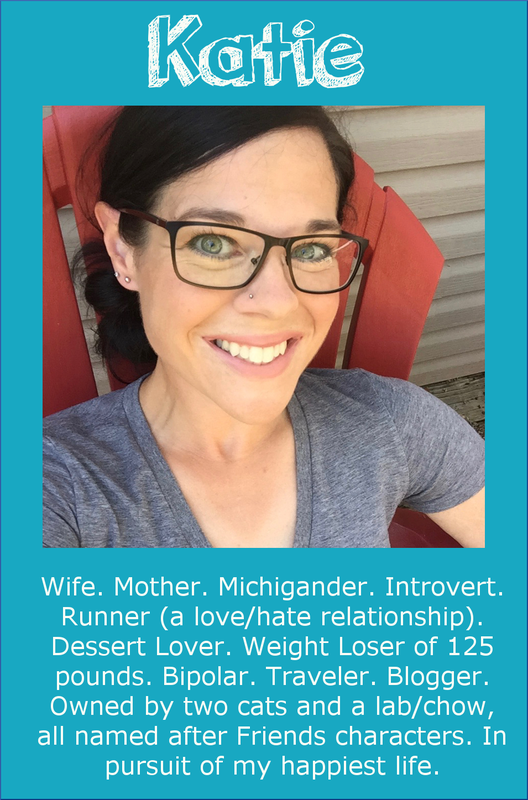 I started doing C25K too and, like her, repeated weeks because I didn't feel ready to move on. I had a hysterectomy recently and couldn't work out for 8 weeks and got cleared to resume exercise in mid-December...just in time for year-end close at work - my busiest time of the year. I was working a lot of overtime and not exercising much so it took me forever to get back to where I was before my surgery (week 4). I'm starting week 5 tomorrow and almost had a panic attack when I saw the 20 minute run this week. It's going to be a challenge but I feel ready. My DH and I are going to do a half this year so I need to get on the ball. Love your blog! Love Carly! THIS IS EXACTLY WHAT I NEEDED TO SEE/HEAR! I have been doing C25K, too...I've been on Week 3 for about 3 weeks now and feeling like a failure. I'm running my first 5K Mother's Day weekend. Knowing that people actually DO need to repeat days/weeks of the training makes me feel so much better!